Metcheck.com - Weather For Next Month - Long Range Weather Forecast For April and May. 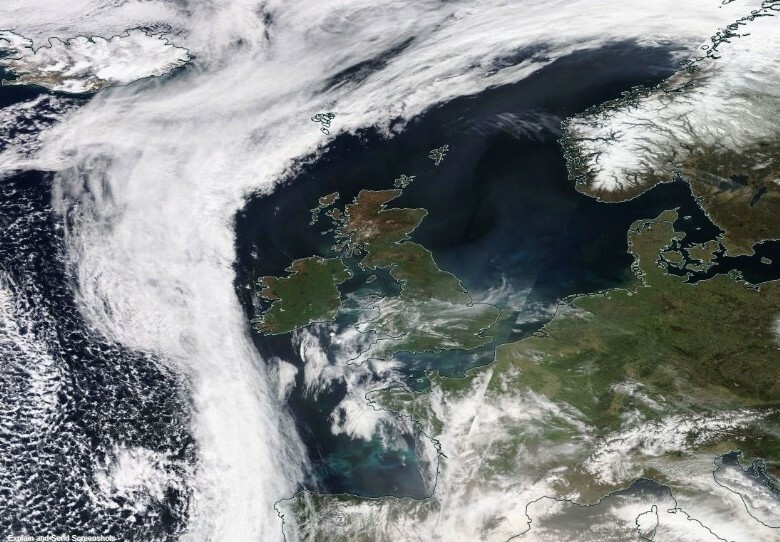 The Metcheck forecast for May 2019 is now available for PREMIUM members. CLICK HERE to log in to view it. The forecast will be on general view from midday on the 25th of April 2019. 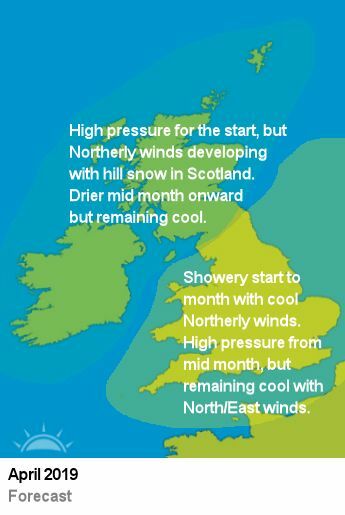 High pressure is expected across the UK at the start of the month, but low pressure from the Northwest will bring cooler Northerly winds across much of the UK with hill snow in Scotland and perhaps a little further South. Showers will become the main feature of the weather mid month, but the mid-Atlantic ridge is expected to dominate once again from the middle of the month with fine, dry weather for many areas, but we expect the high pressure to remain to the West of the UK which will continue to bring in winds from the North or East which will keep temperatures on the cool side. The dominance of the Atlantic ridge continues. This was the main reason behind the poor February forecast and once again we could see another month dominated by high pressure if this trend continues. At present, we expect the block to weaken towards the end of February which will allow the Atlantic to dominate the weather for the first half of the month before high pressure returns mid month. 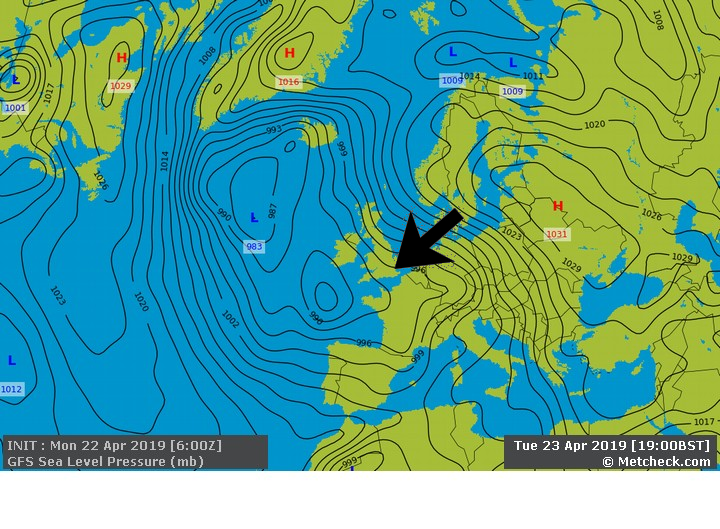 The position of this high is crucial and could bring Easterly winds, but at present we think the high pressure system will be over or to the South of the UK. We expect an unsettled end to March with low pressure systems tracking in from the Atlantic bringing gales and rain with hill snow for Northern areas. Perhaps, one of the most difficult monthly forecasts we have had to do this year due to ongoing SSW and strong mid Atlantic ridge. At present, we are expecting a cold start to the month, however the position of the high pressure is crucial as any snow cover will affect the remainder of the forecast. If snow cover is low then a milder mid month is expected with a return to gales and Northerly outbreaks for the end of the month. If snow cover is extensive across the UK at the start of the month then we expect winter to continue, with frequent snowfall across the UK, in particular for Eastern and Southern areas. 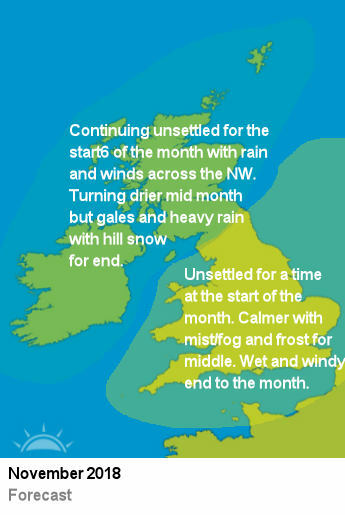 A rather mixed month is expected to start the year with high pressure for Southern areas for the start of the month and a continuation of unsettled weather for Northern areas. Turning more unsettled through the first half of the month with low pressure systems from the Atlantic. We are expecting Easterly winds to develop through the second half of the month, but confidence on this continues to remain moderate. Colder end to the month with severe gales for the North and hill snow for Scotland and Northern England. We are expecting a wet and windy start to December across many parts of the UK as the Atlantic brings in some notable areas of low pressure. 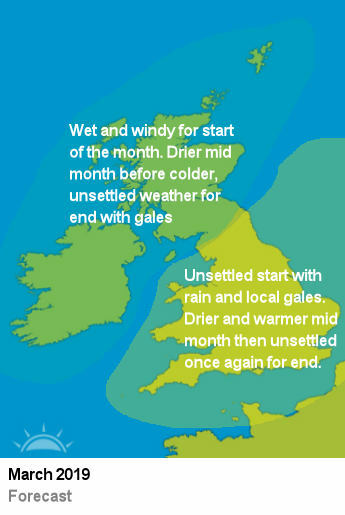 Calmer and drier mid month with high pressure near the UK and the risk of frost and fog, especially for England and Wales. Turning unsettled once again for the end of the month with deep areas of low pressure across the UK and the risk of colder weather from the North/Northwest towards the end of the month around the Christmas period. An unsettled start to the month is expected with transient low pressure areas as well as high pressure ridges affecting the UK. 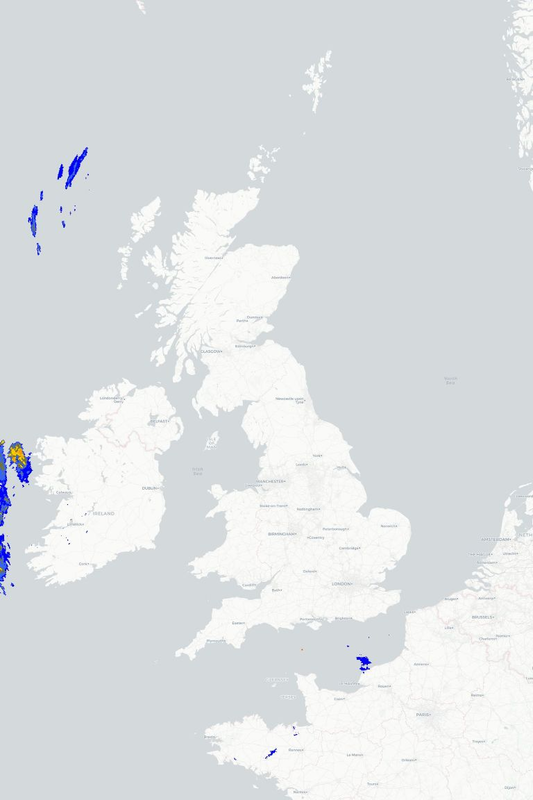 The best of the weather across Southern and Southeast areas with the wettest of the weather for the far Northwest. High pressure is expected to build across the British Isles mid month with the increasing risk of mist/fog and frost across all parts of the UK. We expect a return to very unsettled weather for the end of the month with storm systems coming in from the Atlantic. Metcheck aren't just a load of weather geeks who run computers and make pretty charts... Our in house meteorologists look at pressure trends and patterns developing across Europe and every 25th day of the month at midday we release an outlook for the following month. Every month on the 25th day at midday Metcheck release their forecast for the following month. These are currently experimental and should be taken as such. However, we try to break the month down into the most notable weather types expected. After the month has finished we release the results to show whether the forecast was accurate or not. PLEASE NOTE : These forecasts are experimental and are subject to very wild and random changes. As such, they must NOT be either taken as gospel or issued as being forecasts issued by Metcheck, they are simply a description of what the latest NWP suggests. No agency/outlet is allowed to suggest that this is our "forecast" or "view".